For a quote fill out the Request/Order Form below. Be as specific as possible to assist us to respond. Re: Princess & Baquette Engagement Ring- Style number aeng_zatk. Dear Michael Drechsler, Re: Princess & Baquette Engagement Ring, Style number - aeng_zatk. 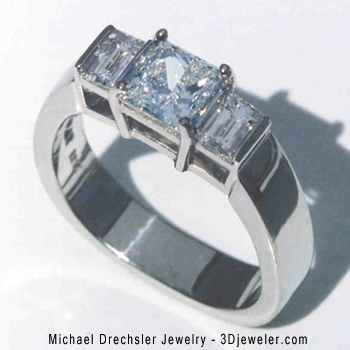 Michael Drechsler and Staff of Michael Drechsler Jewelry Ltd. look forward to hearing from you. For immediate assistance, call us at Toll Free 1-877-717-7226 or Local 604-872-8226. Call us with your orders or any questions! We are here to serve you between 9:00am and 4:00pm PST, Monday to Friday. • Click on the item you are interested in. • Fill out the form Request More Information..
• Your budget for this project. • The finger size you need. • The special occasion date. • The kind and color of stone you would like. • The face size and shape for signet rings, in millimeters. • For Custom Orders we require a 50% deposit, with the balance due upon shipping. • Your quoted Canadian Dollar price includes the shipping in North America. • International FedEx shipping is additional. • We will need to confirm your shipping address. • Your item will arrive in a beautiful wooden presentation box. • We will email or call you prior to shipping with a tracking number. • Your purchase price is spread out over several months. • The price of your jewelry item is locked in the day of your deposit. • This protects you against the fluctuating cost of gold. • Your purchased item is created and reserved for you. • Call us for more details. Convert Canadian Dollars to US Dollars . Universal Currency Converter. Visa, Master Card, PayPal or Bank Transfer accepted.